Continuing the effort to eradicate raccoon rabies in Nassau County, Nassau County Department of Health and Cornell University will distribute raccoon rabies vaccine to protect residents from rabies. Photo by: steph p, via Free Images. What: Rabies bait*, which is attractive to raccoons and includes a vaccine packet, will be distributed in raccoon habitats which include woods, bushes, streambeds, sewers and other areas. When: Truck distribution will be conducted October 13th – October 16th, weather permitting. Where: The additional areas of baiting will include all or parts of following communities: Atlantic Beach, Cedarhurst, Hewlett, Inwood, Lawrence, Long Beach, Valley Stream, Woodmere and Woodsburgh. Why: Three terrestrial rabies cases were reported in southern Kings County last year. Rabies virus has been reported during most years in NYC, presenting a threat of eastward advance into Nassau County. Because of the threat to wildlife and domestic animals from terrestrial rabies, action needs to be taken quickly to prevent rabies from becoming endemic here in Nassau County. 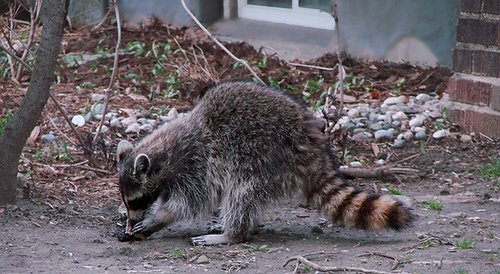 How: Raccoons are attracted by the scent of the bait and are immunized when they eat the contents of the vaccine packet. To avoid inadvertent contact with the baits, supervise children’s outdoor activities both during and for approximately one week following the bait distribution. Keep all dogs and cats indoors or on leashes during the oral bait distribution and for about a week afterwards. This will allow raccoons to eat the vaccine-laden baits and become immunized and will decrease the chance of pets eating the baits. The baits are not harmful to dogs or cats, but a pet may vomit if they eat a large number of them. Do not try to remove a packet from an animal’s mouth. Call immediately in the unlikely event that a child bites through the packet and ingests the liquid. Wash hands immediately before calling to report the exposure if anyone comes in bare-hand contact with the bait (even if the bait is intact.) The bait packet itself will not harm anyone. Call if you have seen your pet with bait in its mouth. Whenever there is direct contact with the bait, contact the Poison Control Center at (212) 764-7667. Remember that it is not possible to get rabies from the vaccine. The vaccine does not contain the rabies virus. It does contain attenuated vaccinia virus. This is a weakened version of the virus used in people for smallpox vaccination. If residents find bait near their homes, but not in the open, leave it alone. The bait packets have a strong fishmeal smell that is not attractive to people or to most other animals. If the bait is intact and out in the open where pets or children are more likely to encounter it, toss it into deeper cover under trees or bushes while wearing gloves or using a plastic bag. Residents who see raccoons should NOT try to trap the raccoons themselves. Call a licensed trapper. General Information: Rabies is a viral infection that affects the nervous system of raccoons and other mammals, including humans. The disease is essentially always fatal once clinical signs of infection occur. Vaccination will greatly decrease the chance of human and domestic animal contact with rabid raccoons. Rabies is transmitted by the bite of a rabid animal. However, the virus may also be transmitted when the saliva of a rabid animal comes into contact with cut, open, or scratched skin lesions. For additional information regarding rabies and baiting, call the Nassau County Department of Health at (516) 227-9663 weekdays from 9:00 AM – 4:30 PM or visit the department website or the New York State Department of Health website. Subject: LongIsland.com - Your Name sent you Article details of "Nassau County Department Of Health Continues Rabies Baiting Program"